The Central Bank will end 2018 by holding its fourth annual conference on 2018/12/10 under the slogan (Development Role of the Central Bank), which will discuss two key axes: the development dimension of monetary policy and the developmental role of the banking sector. The conference comes at a time when the Iraqi people are looking to complete The ministerial cab of the new government and the start of the process of economic reform and economic stability, according to the government curriculum comes and the central bank is subjected to a campaign of malicious and unfair away from neutrality and equity and proper evaluation of the efforts made by the Central Bank in the The economic and security shocks are a confirmation of his success in achieving his annual plan for 2018 in supporting the national economy during the economic and financial crisis and the war on terror. His measures and policies have formed a bright spot and a successful success experience in a country that is going through harsh conditions and a historic phase that is the hardest to face the economic challenges. The stability of the exchange rate of the Iraqi dinar against the US dollar and maintain the inflation rate of not more than 2% and the level of foreign reserves within the rates according to international standards, where the foreign reserves of Iraq amounted to 62 billion dollars and the third alternative Arab and the adequacy ratio exceeded 160% according to the latest international standard for measuring efficiency and stimulate the sector Regulatory, supervisory and supervisory banking and the establishment of new units within the regulatory structures of banks such as compliance and combating money laundering and financing of terrorism, credit and operational risk management and banking awareness and the issuance of the Money Laundering Law 39 for the year 2015 and the development of systems Payment and the application of all electronic payments by retail and mobile and the establishment of the national division and work on the application of international standards in financial reportingInline with the transparency and disclosure principle, the Bank's efforts to stimulate financial inclusion and focus on the initiative to settle the salaries of employees in order to increase the financial coverage of the population who do not have accounts in the banking system, which amounted to 22.6 and activate the initiative to finance small and medium enterprises. At the level of international banking relations, the Central Bank and the exceptional efforts of the Governor and his team have succeeded in restoring relations with Arab and foreign central banks and delivering the achievements of the past four years to the international financial institutions such as the Financial Action Group ( FATF ) (Gray) to normal follow-up. The visit of the Governor to the UN Security Council and his presentation of the achievements and organizational, structural and technical developments and compliance with international standards in financial reporting, Iraq 'seconomy and Iraq 's ability to adhere to international credit benefits as the accolades of the World Bank and the IMF have had a clear impact in strengthening economic resilience and financial victory and move steadily towards financial sustainability. Through the efforts and wise measures and applications of monetary policy and development measures, the Bank was able to draw and implement its strategy for the years (2016-2020), which aims to achieve economic stability and stimulate the growth of fiscal and financial coverage and structural and institutional construction and investment in human capital optimization through the achievements of the most prominent stability of the exchange rate of the Iraqi dinar against The US dollar and maintain inflation by not more than 2% and the level of foreign reserves within the rates according to international standards as the foreign reserve of cash to Iraq by $ 62 billion and the third rank Oh and by the adequacy of more than 160% according to the latest international standard to measure efficiency and stimulate the banking sector regulatory and supervisory and regulatory and establishment of new units within the organizational structures of banks Kalamtthal and anti-money laundering and terrorism financing and management of credit and operational risk and awareness of banking and the issuance of money laundering, 39 Law for the year 2015 and the development of systemsIFSR is in line with the principle of transparency and disclosure. In addition, the Bank's efforts are exerted daily to stimulate financial inclusion and focus on the initiative to settle the salaries of employees in order to raise the financial coverage of the population who do not have accounts in the banking system, which amounted to 22.6 and activate the SME initiative. Moose you know I love this guy Nusairi. In my opinion everything is done. We just need to watch history happen. Merry Christmas. @Jimplants wrote: Moose you know I love this guy Nusairi. In my opinion everything is done. We just need to watch history happen. Merry Christmas. You're right Jim, this guy is the head of all that goes for the economy side, and it's him, and the director of the central bank who have restructured the banking sector, and we should have a nice start 2019 my friend, be the beginning of January, can not wait to see what will happen on January 2, 2019, 25 days of waiting !!! very happy to finish this adventure with you !! It has been a LONG FRUSTRATING 10 plus years. I look forward to seeing your part of the world. @Jimplants wrote: It has been a LONG FRUSTRATING 10 plus years. I look forward to seeing your part of the world. You are welcome to Quebec my friend Jim, and I will make you a meal of moose steak, with a good bottle of red wine, and celebrate our new life !!! 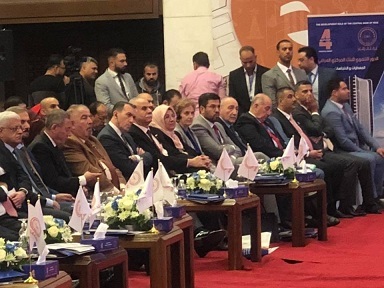 The activities of the fourth annual conference of the Central Bank of Iraq were launched on Monday, coinciding with the anniversary of the Iraqi victory day. 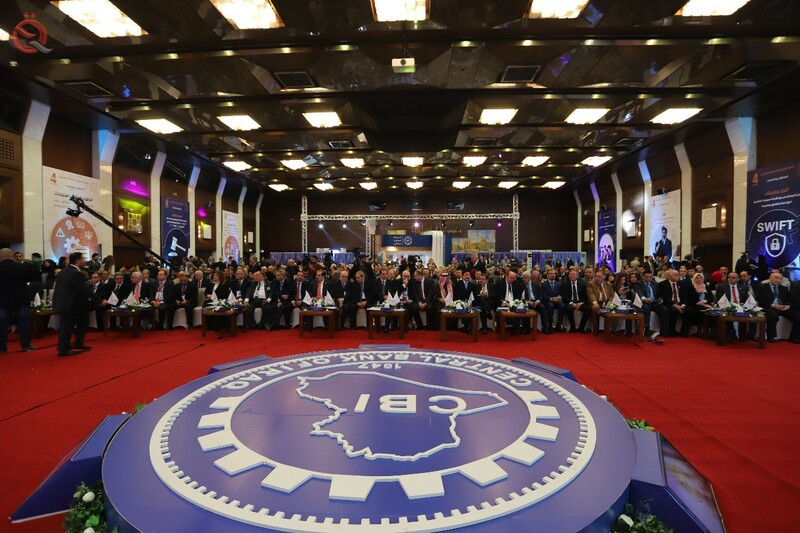 The conference is held under the slogan "The development role of the Central Bank of Iraq data and trends." The third session will discuss the "relationship between the monetary and financial policies", the second related to "the role of the banking system in stimulating the private sector (international experiences), while the third session will discuss the" development dimension of monetary policy in Iraq. " 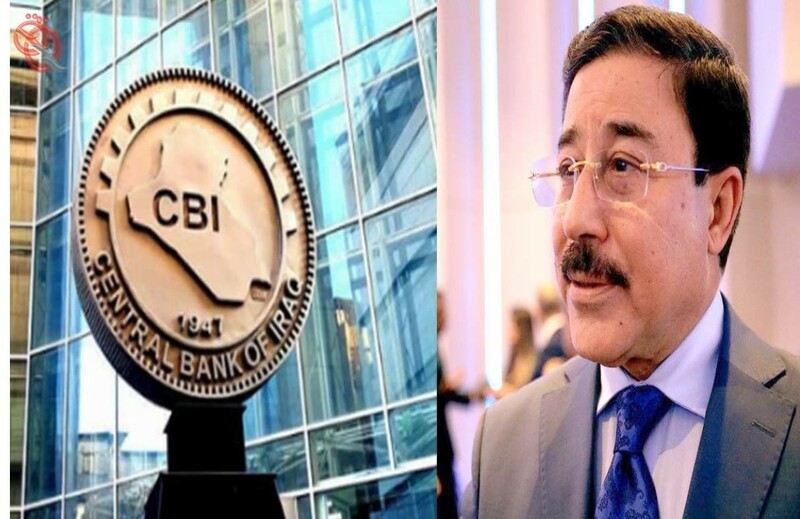 The governor of the Central Bank of Iraq, on Monday, the importance of the rule of law to address the phenomenon of non-performing loans, noting that the value of non-performing loans amounted to 6 trillion dinars. The governor of the Central Bank of Iraq, Ali Alallak, in his speech on the sidelines of the conference, which was attended by "Economy News", that Iraq "need effective measures to extend the rule of law to address the phenomenon of non-payment of loans by the borrowers," pointing to "the presence of more than 6 trillion dinars Of non-performing loans out of 37 trillion dinars. " He added that "the central bank has become a leading move in monetary policy in Iraq, and even in the Middle East and North Africa," noting that "concealing the real sector embodied in monetary policy through many initiatives, including the industrial, agricultural and industrial lending of 5 trillion dinars, Financing small projects by a trillion and a half through private and public banks, the largest in the history of Iraq. " "The Central Bank was able to withdraw the economic shock suffered by Iraq through quantitative management, ie pumping liquidity to the market through the purchase of treasury transfers." He stressed the need to "provide a stable environment and a real will to activate the private sector and protect the national product." The head of the Association of Iraqi Private Banks Wadih al-Hanalal said on Monday that the Association has achieved during the year 2018 great achievements at the banking and community levels, pointing out that the Association seeks in its vision of the future to continue what it started this year. 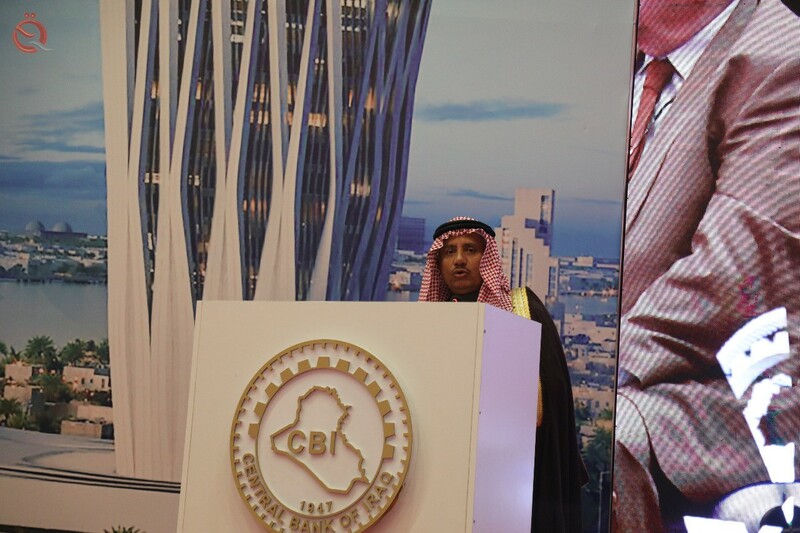 "I am pleased and honored to participate in this important conference, and congratulated the Central Bank and the banking sector on the classification we obtained from the International Financial Action Organization, which transferred Iraq from the region," Al-Hantal said in his speech at the Fourth Annual Conference of the Central Bank of Iraq. "This is the result of the banking procedures taken by the Central Bank in the classification of anti-money laundering and the financing of terrorism, which today is a fundamental issue and important in cooperation between financial institutions and countries." Al-Hantal added, "We can not mention in this regard the role played by the Central Bank of Iraq in many areas in supporting the development of the banking sector and in promoting joint efforts between it and the government and the private sector, for example the project of settling salaries and work on tax reform and the transfer of tax procedures To the stage of electronic governance, so as to achieve control over customs imports and control without Hadrafsad. Al-Hantal added that the Association has made significant achievements in the banking and social sectors during the current year and has taken great strides towards strengthening and strengthening human capabilities through organizing 33 specialized courses, seminars and workshops with 852 trainees until November 11, 2018. The Association also represented the banking sector in many local forums and international and international conferences in addition to its participation and representation of banks and creating a link with many institutions including the US Treasury, the World Bank, the International Monetary Fund and the Union of Banks. Arab institutions and other actors, in addition to coordination with institutions and government ministries in various configurations. " "In the area of ​​agreements and cooperation programs, the Association succeeded in concluding six memorandums of understanding during the year 2018, most notably memorandums of understanding with the Association of Banks of Bahrain, the College of Management and Economics of Baghdad University, the Union of Arab Banks and the General Council of Islamic Banks as an authorized agent in Iraq. Central Iraq ". Al-Hantal pointed out that "the Association and the banks participated in large exhibitions to promote the concept of financial inclusion, including the Book Fair and the Baghdad International Fair with wide Iraqi, Arab and foreign participation and special exhibitions in universities and markets for the dissemination of banking services in addition to their participation in Iraq reconstruction conferences in Kuwait, Jordan and Baghdad "He said. 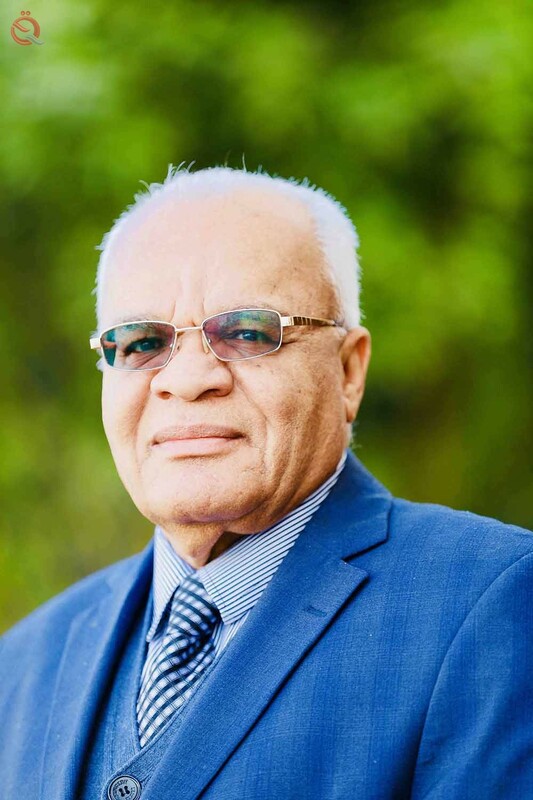 And the President of the Association of Private Banks, "There is no time to list and review more achievements of the Association in 2018, especially in the field of humanitarian activity and society, and in the prequalification of more than 20 areas of Baghdad within the initiative of Baghdad, Enabling and ensuring coordination with the Central Bank of Iraq to support the Iraqi drama and the establishment of two large ceremonies on the occasion of World Peace Day in Baghdad and Paris, as well as support the displaced along with the campaign of our people led by musician Naseer Shamma. 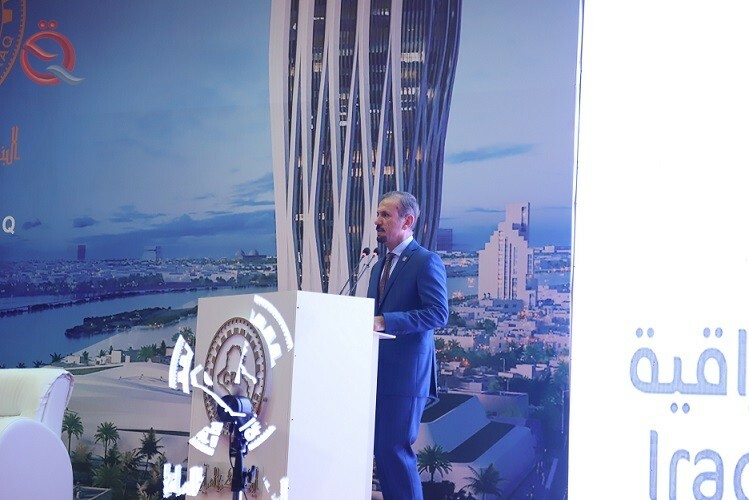 Al-Hantal said, "The Association seeks to achieve a clear and ambitious future vision for the coming year 2019, which will require us to continue in the course of this year, especially in the field of human capacity building for employees in the banking sector and to seek greater opportunities for private banks through dealing with them. The government will continue its efforts to achieve the goals of financial inclusion in accordance with the perspective of the Central Bank of Iraq and in the framework of diligent efforts and strategic plans. Which will restore Iraqi banking relations to normal. " "The Association of Iraqi private banks as one of the institutions of civil society and one of the pillars of the private sector will not hesitate to continue the path, which despite the short life achieved great successes." The Arab Monetary Fund said on Monday that the Central Bank of Iraq "a good example" of the development role of central banks in the Arab National Bank, pointing out that the bank maintained the stability of the currency and take many measures that contributed to the strengthening of the Iraqi economy. The head of the Arab Monetary Fund Abdul Rahman al-Humaidi said in his speech during the fourth annual conference of the Iraqi Central Bank in Baghdad and attended by "Economy News", "The central bank has great efforts in support of the Iraqi economy, and maintained the stability of the currency and adopted many actions and initiatives Which would strengthen Iraq's financial situation. " Al-Humaidi added that "the positive social effects of the financial coverage launched by the Central Bank can not be ignored," noting that "the bank is an example of the developmental role of central banks." "The Bank also contributed to the enhancement of financial coverage and the establishment of governance and transparency, and the Arab Monetary Fund praises the efforts and achievements achieved by the Central Bank and reflect on the Iraqi economy," pointing out that "the bank was able to stabilize the dinar exchange rate and control inflation" . 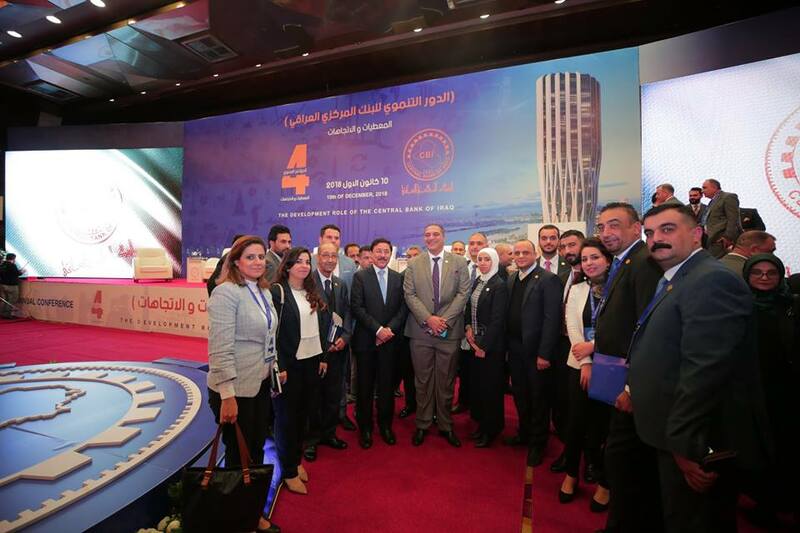 And began on Monday, the activities of the fourth annual conference of the Central Bank of Iraq, in conjunction with the anniversary of the Iraqi victory day on "Daash." The governor of the Central Bank Ali Al-Alak said Monday that the bank maintains a high level of foreign reserves, pointing out that the bank continues its efforts to stabilize the local currency. Al-Alak said in a speech during the opening of the fourth annual conference of the Central Bank in Baghdad and attended by "Economy News", that " coinciding with the first anniversary of the victories of the security forces on the organization is calling, this annual conference is looking forward to the sustainable development of the Iraqi economy," noting that " Continue his efforts in stabilizing the local currency. " "The central bank maintains a high level of foreign reserves," he said. 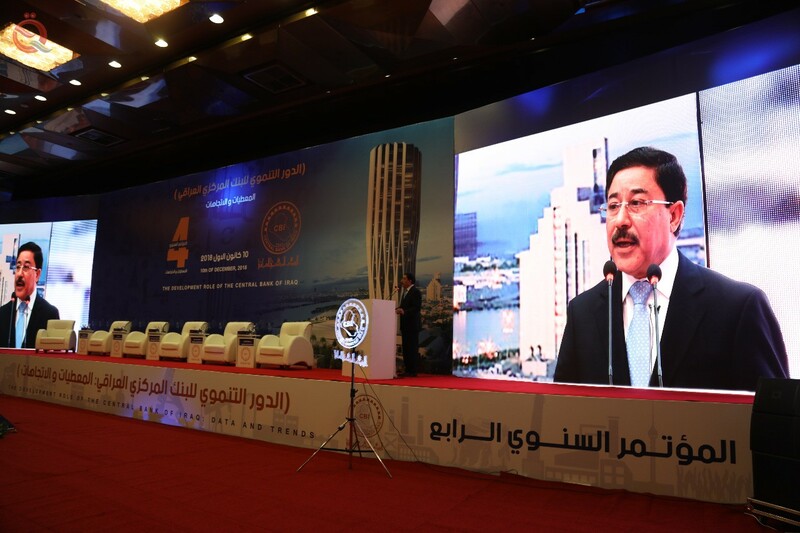 In the presence of HE Dr. Ali Mohsen Ismail, Governor of the Central Bank of Iraq, HE Dr. Abdulrahman bin Abdullah Al-Humaidi, Director General of the Arab Monetary Fund, delivered an opening speech at the fourth annual conference of the Central Bank of Iraq, Trends ", organized by the Central Bank of Iraq on 10 December 2018 in the capital Baghdad. 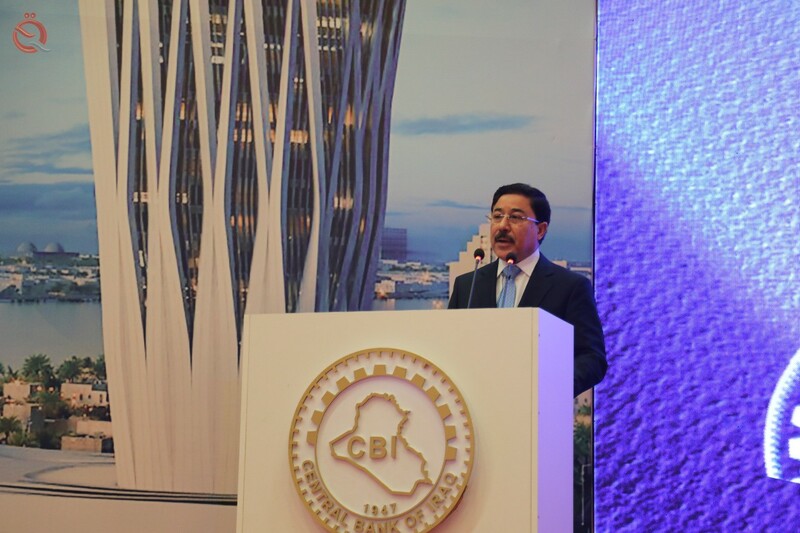 His Excellency praised the beginning of the speech on the theme of the fourth annual conference of the Central Bank of Iraq, which reflects the renewed role of central banks in achieving monetary stability and contribute to the establishment of the fundamentals of economic growth and sustainable development. He also praised the great efforts exerted by the Central Bank of Iraq in the last few years to support the efforts of economic and financial reform undertaken by the Iraqi government in its efforts to meet the challenges of unemployment and achieve comprehensive and sustainable growth, which played a key role in establishing monetary and financial stability and achieving remarkable progress. On the performance indicators of the financial sector and banking and financial coverage. Al-Humaidi also praised the efforts of the Iraqi Central Bank through a prudent monetary policy which succeeded in stabilizing the Iraqi dinar exchange rate and controlling inflation to less than 2 per cent, as well as significantly boosting foreign exchange reserves to more than $ 60 billion.The establishment of a deposit insurance company, the adoption of a national strategy to combat money-laundering, and the interest in banking awareness and public protection. He noted in this context that Iraq will withdraw from the follow-up department this year, FATFRecommendations . He also praised the efforts of the Central Bank of Iraq in terms of financial coverage, and expressed its pleasure in partnership and cooperation with the Bank in building a national strategy for financial inclusion in the framework of the initiative to enhance financial inclusion in the Arab countries. Finally, His Excellency stressed the interest of the Arab Monetary Fund in the topics of modern financial technologies and their applications, aware of the great opportunities offered by these technologies, without neglecting the hedging of risks. He pointed out in this regard the Fund's keenness to address the topics of applications of modern financial techniques, Thus encouraging the exchange of experiences and experiences among the Arab countries in this regard, and in this regard he referred to the establishment of the regional working group on financial techniques. On "The Development Role of the Central Bank of Iraq - Data and Trends"
Development of the Central Bank of Iraq - Data and Trends ". , In recognition of the Arab Summit of 2018 for its efforts to achieve financial and monetary stability. In terms of performance indicators of the financial and banking sector and financial coverage. Payment and settlement on the other hand. Number of clients and transactions, thus codifying informal channels. Thus reducing unemployment and poverty rates, improving income distribution and raising the standard of living. An area to support the balance of payments and to meet economic challenges and crises. To be addressed in the coming period. Action to address the challenges of unemployment and encourage innovation and innovation. In 2014 to around 23 per cent for 2017. During the Arab Financial Inclusion Day. Arab countries, and the role of capital markets in financing development needs. Pension funds and pensions are a priority in this context. Tuesday, December 11, 2018 in Abu Dhabi city. • Enable the Arab Monetary Fund to achieve its objectives. [rtl]Le gouverneur de la Banque centrale d'Irak, Ali Al-Alaq, a déclaré que la politique financière posait des problèmes à la banque, soulignant lors de la session consacrée aux "relations entre les politiques financière et monétaire", qui avait eu lieu dans le cadre des activités du quatrième rapport annuel. conférence de la banque lundi, l'écart grandissant entre les non pétroliers des [size=22]revenus qui ne ne couvre pas seulement 10 pour cent des dépenses, et se fondant sur les ressources pétrolières pour couvrir les autres dépenses, a mis le pays en difficulté que les prix du pétrole ont diminué en dernières années. Il a ajouté que cette forte dépendance vis-à-vis du pétrole augmentait les ratios de risque et la pression exercée sur la banque centrale pour combler l'écart, soulignant que les recettes pétrolières avaient chuté d'environ 70%, tandis que le gouvernement avait réduit d'environ 20% de ses dépenses pour compenser les pertes. cette réduction. Il a souligné que ces problèmes conduisaient à deux options, soit le sacrifice de la part de la banque centrale dans ses réserves de change , tandis que la deuxième option consistait à modifier le taux de change, ce qui nuisait aux citoyens et augmentait la richesse de l'économie. les riches et l'appauvrissement des personnes à faible revenu, soulignant que la relation entre les deux politiques, la finance et la trésorerie, constitue un véritable défi pour la banque centrale. La banque maintient un niveau élevé de réserves de change et poursuit ses efforts pour stabiliser la monnaie locale, contrôler l'inflation et augmenter la croissance économique du pays. Il a souligné l'élargissement du volume des prêts improductifs en Iraq pour atteindre 6 000 milliards de dinars sur 37 000 milliards de dinars, soit le volume total des prêts, soulignant que les banques ont réduit de 2 500 milliards de dinars leurs bénéfices ou de 16% du capital pour couvrir leurs besoins. ce problème, appelant à la nécessité de renforcer l'état de droit pour faire face au phénomène des prêts non productifs. [rtl]For his part, the President of the Association of Iraqi private banks Wadih al-Hanal, in his speech during the conference, that "the Association seeks to create greater opportunities for private banks through dealing with them on an equal footing with government banks, especially in the area of ​​the settlement of salaries of employees." He continued: "The Association will also continue its efforts to achieve the goals of financial inclusion in accordance with the perspective of the Central Bank of Iraq and in the framework of his hard work and strategic plans ... and continue to work to remove obstacles to the creation of a network of correspondents from foreign banks, which will restore Iraqi banking relations to normal. Baghdad, Dec. 10 (Petra) - The Governor of the Central Bank of Jordan, Dr. Ziad Fariz, met in Baghdad Monday with Iraqi President Barham Salih during a visit to Baghdad to discuss cooperation between the two countries. Dr. Farez also met with Deputy Prime Minister and Minister of Finance Dr. Fuad Hussein and discussed with him issues related to the joint free zone between the two countries and customs exemptions for Jordanian goods, along with the rapid line between Trebil and Baghdad, developments of the oil pipeline project from Basra to Aqaba and a number of financial issues of common concern . During the meeting, they reviewed the bilateral relations between the two brotherly countries, especially the economic and financial sectors, and discussed the best means of joint cooperation. The two sides also discussed the development of trade relations and finding a solution to the problems and obstacles facing the trade exchange process through the development and rehabilitation of the highway between Baghdad and Amman as well as customs cooperation. The Deputy Prime Minister of Iraq to his country's keenness to establish the best relations with the Hashemite Kingdom of Jordan, and said, "We will examine all obstacles." 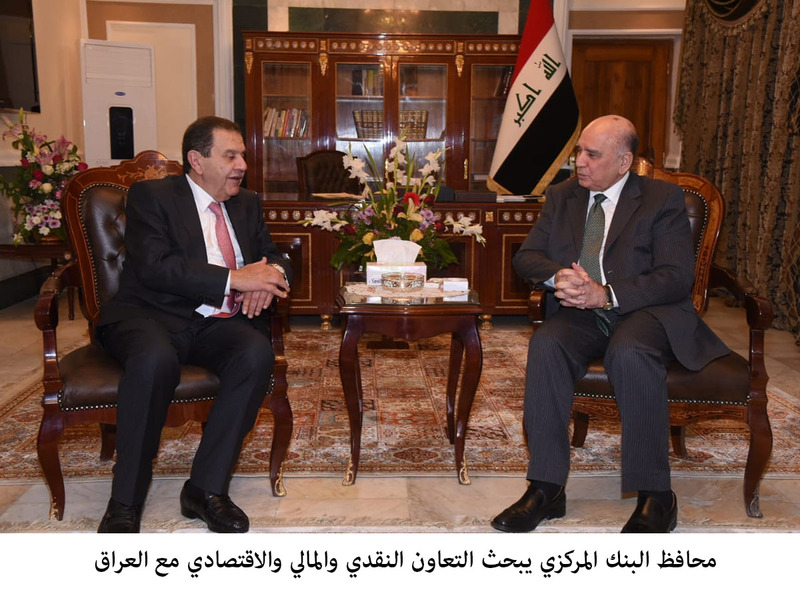 The meetings were attended by the Jordanian ambassador in Baghdad, Dr. Montaser Al-Aqla. Dr. Fariz arrived in Baghdad yesterday night and was received by the Governor of the Central Bank of Iraq, the Deputy Governor, the Jordanian Ambassador in Baghdad and the embassy staff. 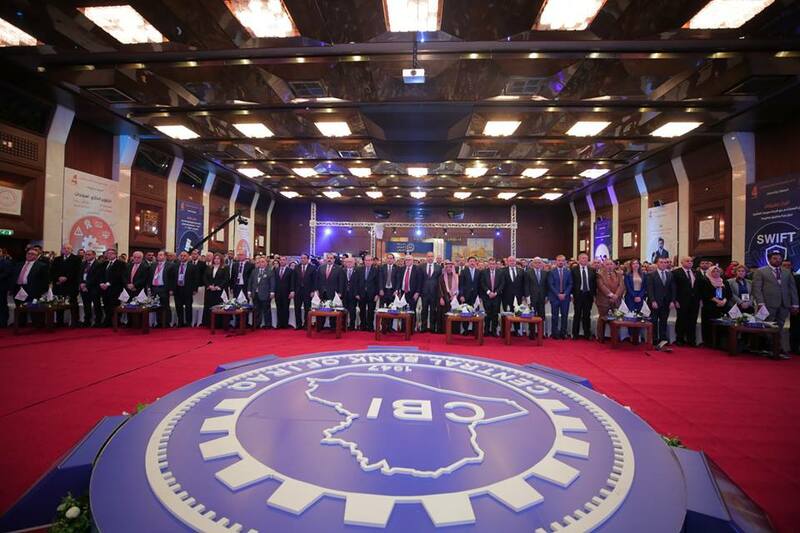 The Governor participated in the opening session of the Fourth Conference of the Central Bank of Iraq on the development role of the Central Bank of Iraq, and reviewed the efforts of the Central Bank of Jordan in maintaining monetary stability as one of the main pillars of economic growth. Dr. Fariz also expressed his keenness to strengthen cooperation between the central banks of Jordan and Iraq in the interest of the two countries. Dr. Fariz also reviewed the initiatives of the Central Bank of Jordan in supporting economic activity, especially small and medium enterprises and the financing program for the promising economic sectors through providing financing to these sectors on concessional terms through Jordanian banks . Dr. Fariz participated in the conference with a delegation from the Central Bank, including Dr. Rajeh Al-Khadour and Hussein Al-Rifai. 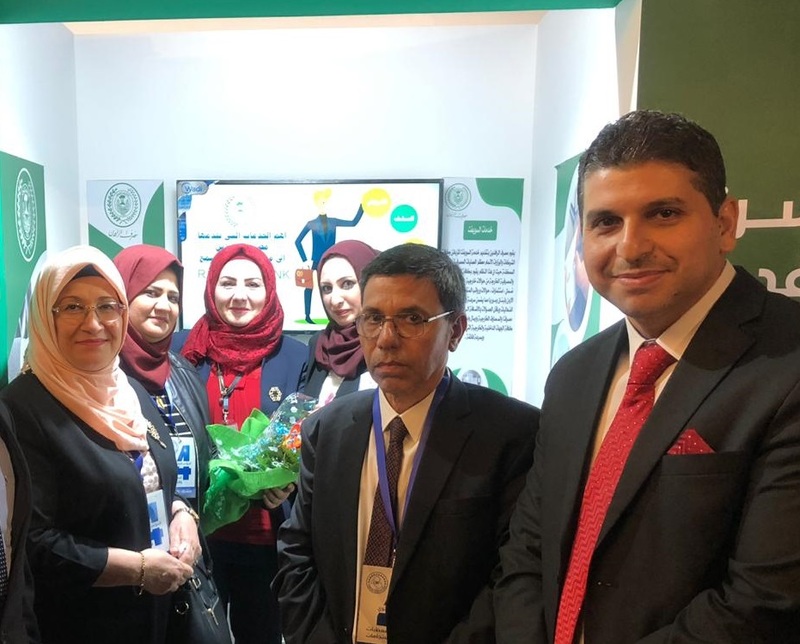 Al-Rafidain Bank participated in the activities of the fourth annual conference of the Central Bank of Iraq under the slogan of the development role of the Central Bank of Iraq. Data and Trends The Bank's Information Office stated that the Director General of the Bank Dr. Khawla Taleb Jabbar attended the conference which dealt with the relationship between the monetary and financial policies and the role of the banking system in stimulating the private sector (International experiences) in addition to the developmental dimension of monetary policy in Iraq, and pointed out that on the sidelines of the conference banks have introduced their banking products has seen the pavilion of the Rafidain Bank popular popular by political and economic figures and saw the For banking services provided by the bank.